The use of glass ampoules has been the most common standard for containing sensitive pharmaceuticals and biotech products since its inception over a century ago. However, with the proliferation of more innovative packaging solutions, many pharmaceutical manufacturers are adopting plastic vials for injectables due to the reduction in drawbacks attributed to packaging products in glass containers. LF of America is an innovative packaging company intent on delivering new solutions that meet the challenges faced throughout the pharmaceutical industry. We’re proud to announce our latest solution for reducing the contaminant concerns and fragile qualities of glass containers, challenges pharmaceutical manufacturers and industry workers encounter regularly. Our new plastic vials with luer lock fittings for injectables are a safe and practical alternative to glass ampoules and prefilled syringe storage. Vials storing injectables are required to meet strict regulatory standards for product safety assurances. Although glass ampoules have excellent barrier properties, chemical resistance, and remain generally compliant, the increasing demand for lightweight and durable pharmaceutical packaging options continues. The fragility of glass, along with drug and container interaction concerns, has led to a growing interest in plastic vials designed to efficiently fill, ship, store, and administer injectables safely. What our new plastic vials provide manufacturers and industry professionals is the ability to achieve all of these goals without the dangers associated with glass storage. From production to administration, every step of the process can be assisted by the dependability of this innovative packaging option. Designed with a luer lock fitting, the empty syringe screws directly into the luer on the vial for safe liquid transfer. Once the content exchange is completed, the vial can be disposed of while the syringe is prepared for administration via a needle or directly. 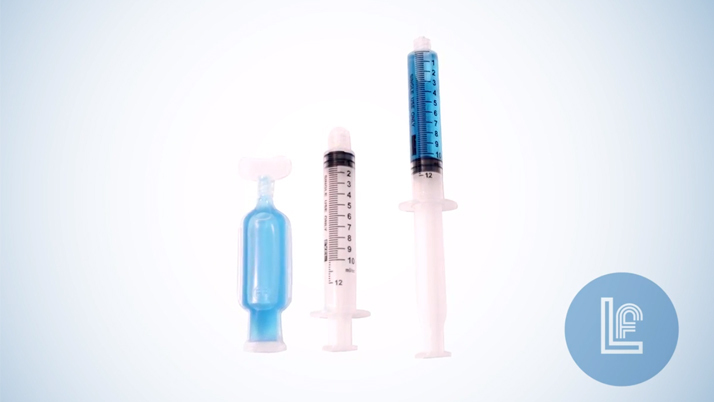 The plastic vials for injectables are designed as unit-dose packaging systems in 5-vial strips. Currently available in 10 mL and 20 mL capacity, each plastic vial can also be designed to hold the precise measurement for the appropriate single dose amount in any container size required. LF of America is proud to be a turnkey contract packaging and filling company. We provide contract filling services using state-of-the-art machines equipped with fill and seal and injection molding technology. Each fill is performed inside a completely sterile ISO-5 environment for quality and safety assurance. In addition, our filling machines are available to buy directly for manufacturers and companies looking to incorporate their own in-house packaging solution. To discuss our contract packaging and filling services or for other questions regarding our new plastic vials for injectables, please contact LF of America for more information.